This is a true story. Lynn and I went to hop out on to our roof and enjoy some nice April weather and were greeted with an inordinate amount of Dog crap lying outside our window. damn. 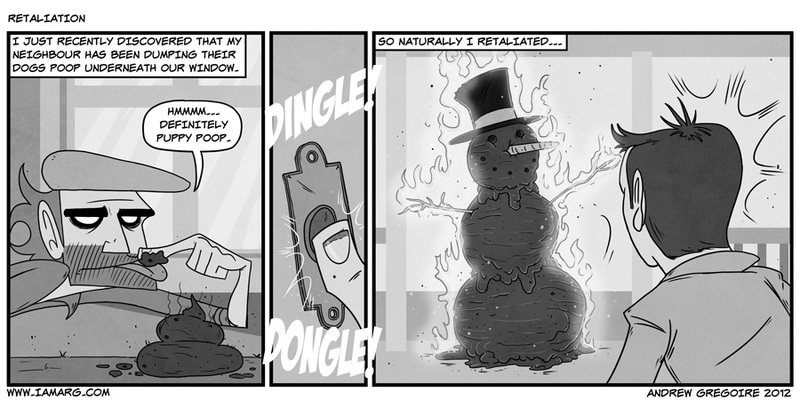 a poop snowman… how do you … nevermind. The rules of escalation are in full effect. . always. But a flaming poop-man. . that good sir is a special kind of awesome. Flaming poop is the only logical next step. Sentience or plasma is the next step. It only could have been more awesome if the flaming poop man was walking their dog, and the dog was on fire as well. If only you could of found a stick that looked like it was flipping the bird, then the poopman would have been complete. I can’t stand obtuse neighbors… I’m happy I don’t have to deal with them, I’d probably be more inclined to have people arrested or go through pranks or something. Or ya know what? Lifehacker. plenty of nefarious science running around there, for those willing to prank/etc. others. Smells like sh$$, looks like sh%%, it even tastes like sh&&! It definately is [email protected]@! What? Not a giant poop dong? Where is the old ARG? I found your site through project wonderful. It’s hilarious. Great stuff. Appropriate counterattack. I see no reason to get authorities involved. Very well played, sir. Although I’m quite curious how you got it to hold a flame. Puppy poop isn’t all that flammable, so far as I am aware. That’s a top hat, isn’t it? What happened to the unicorn(s)? You just HAD to taste it, ha ha! Except it wasn’t a snowman, it was a pile. and it wasn’t on his porch, but in his BMW. You can taste the difference between puppy and dog? And, presumably, the difference between puppy, kitten, and human? And where, pray tell, did you learn this? Enquiring minds want to know! How on Earth would one get that crap (Ahem!) to stand? I would think it too soft and squishy, depending on its age, of course. A slow fuse, from the flame on top, to some blasting caps placed strategically inside the uh, apparition, would make the cleanup a more, um, interesting proposition! Almost two and a half years, and no one has mention a shitfire?